We seek to promote and support the transition of communities in Western NC and Southern Appalachia towards resilience, diversity & inclusiveness, sustainability, and a regenerative, just economy in an era of global climate destabilization. 1. That life with dramatically lower energy consumption is inevitable, and that it’s better to plan for it than to be taken by surprise. 2. That our settlements and communities presently lack the resilience to enable them to weather the severe energy shocks that will accompany peak oil. 3. That we have to act collectively, and we have to act now. Transition Blue Ridge began as Climate Voices US, a Boone-based nonprofit concerned with raising climate awareness and empowering communities to build renewable energy futures. In late 2017, after some changes to the structure of Climate Voices US, we began a process of reflection regarding the direction of our organization. Sometime during this process of reflection, the Transition Movement grabbed our attention and wouldn’t let go. To us, Transition represents an opportunity to reimagine our world and seek better ways of living using a participatory approach that can be practiced by community members in their everyday lives. It is a movement perpetuated by people who are excited to step up and address the biggest challenge of our era - climate change - by starting local. On November 28, 2017 we had our first community Transition meeting at F.A.R.M. café, and have been meeting monthly ever since as a growing community of hopeful people who are determined to reclaim the economy. 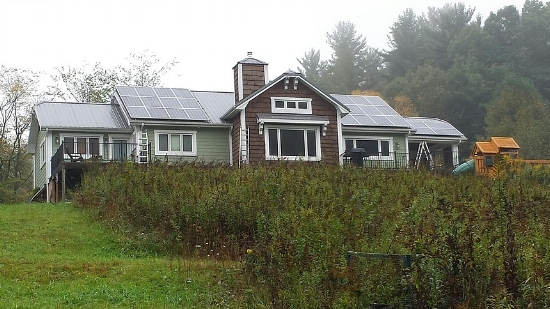 Our Clean Energy for Boone Program added 313 kW of solar PV and/or energy remediation of 39 homes. We spearheaded the Boone Community Solar Station, a public-private collaboration between the Town of Boone, Climate Voices US, and for-profit investors. This project was designed to create a high-impact, visible, symbolic representation of a solar PV installation and EV charger to educate and motivate the public about the simplicity and availability of solar PV energy. We performed advocacy and outreach for NC WARN during their campaign against Duke Energy. We mobilized dozens of community members to show up for Boone during the Rise for Climate in Appalachia & Around the World event. We sponsored two buses full of students to travel to New York City and participate in the 2014 People’s Climate March. We had 110 ASU students join us for the trip. This group came away with a vision of a successful event and the feeling that activism can overcome all the special interest money that presently holds our Congress hostage. Additionally, we sent another bus to Washington, DC to attend the 2016 People’s Climate March.